So what’s that banner pic about? So I want to truly thank everyone who took a few seconds to click, a minute or two to read, or five to comment on yesterday’s post. I hope you check back from time to time. All this traffic has its benefits–I’ve found dozens of new blogs from everyone who has left a comment or liked a post. It’s inspiring to see so many fantastic blogs out there. Filed under Shipwreck culture, Source of the Week, Where'd it come from? CHARLOTTE is a film about an extraordinary boatyard, the Gannon & Benjamin Marine Railway, located on the island of Martha’s Vineyard, Massachusetts. Ross Gannon and Nat Benjamin established the boatyard in 1980 with the purpose of designing, building, and maintaining traditionally built wooden boats, and in the process they transformed Vineyard Haven harbor into a mecca for wooden boat owners and enthusiasts. After a long career of designing and constructing boats for others, Nat embarks on building a 50 foot gaff rigged schooner for use by his family and friends — her name is Charlotte. Through close observation of the everyday activities of the boatyard, the film emerges as a meditation on tradition, craftsmanship, family, community, our relationship to nature, and love of the sea. For another great coastal documentary see this earlier post about Ray: A Life Underwater. 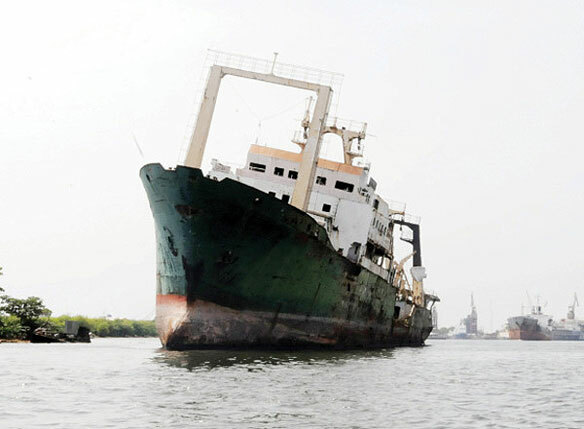 Nigeria has a shipwreck problem. According to Leadership Sunday, a prominent Nigerian newspaper, the country has become “a dumping ground for old ships and abandoned marine vessels.” By their account, 100 shipwrecks and derelicts litter Nigeria’s 530 miles of coastline. That’s a lot of wrecks in a small space and rumors of conspiracy are in the air. One merchant captain told the paper that some Nigerians may have connived with the owners of the ships to dump them in Nigeria. Nigerians own about 40 of the wrecks. Despite being obvious navigation and environmental hazards, few wrecks are likely to be removed anytime soon because of the staggering cost of salvage. Experts estimate that it will cost approximately 70,000,000 naira (about $450,000) to dismantle each vessel, a heavy burden during an economic downturn. Chief Philip Asiodu, president of the Nigerian Conservation Foundation, told the paper that the shipwrecks are time bombs waiting to explode, concluding: ““It would be an act of monumental irresponsibility for us to close our eyes to this issue.” Judging from the article, it appears that awareness to the “shipwreck problem” is growing. Action can’t be too far in the offing, at least that’s the hope. For more see this and this. 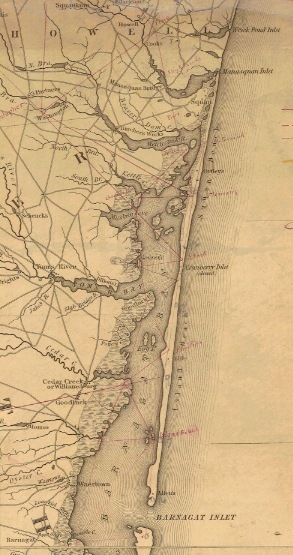 The chapter I’m writing now focuses on the stretch of the New Jersey shore bounded by Barnegat Inlet and Wreck Pond. Fortunately, there are a lot of New Jersey maps and charts that are readily available–Rutgers University has collected many and linked to them here. The image on the left, taken from an 1833 state map, offers a unique window onto the coast at the time it was made. Zoom in (image on the right) and we can clearly see the landscape as well as the roads (not all of these had actually been built), taverns (house with a flagstaff), and settlements (few and far between) that defined life on the nineteenth-century coast. Invaluable knowledge for any understanding of shipwrecks or coastal life during this or any time.